I have heard this quote before of Maya Angelou and these words have always made me stop and think. Most of all they make me just stop. We are always running around and breathing in and out as we hurry here to do this and hurry there to do that. Never stopping to really look where we are going and what we are doing. We count off on our daily to do list what we have accomplished for that day and congratulate ourselves on a day well done. But is that list all that is really important in this day and in this life? What we count off, is it that which is important? What if we just stopped ourselves in our tracks? What if we truly just looked around us? What if we just took in that view? What if we just stopped and looked at the night sky to check out the phase of the moon that night? What if we stopped by our daughter’s house to just say hello and give her a hug? What if we took our dog for a walk and noticed how beautiful the fall leaves were-how colorful? Or how funny to see our dog jump into a leaf pile and practically disappear with just their tail wagging? The little things in life that make us smile and also just make us stop and fill us with wonder? Seeing that rainbow in the sky arching over that clouds where the sun was trying to peak through. These moments that take our breath away are the parts of life that we value and that truly make up our lives. These are the moments that make our heart sigh and sing at the beauty of life. 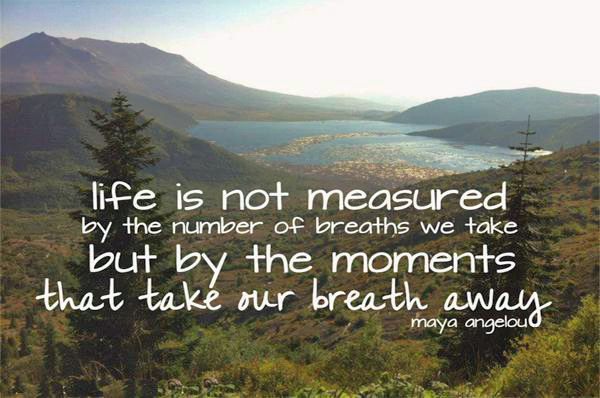 What moments today took your breath away? This is one of my favorite quotes too.